I remember when I first moved to New York, everyone made a point to emphasize how much you walk around in the city. I didn’t think much about it at the time — I like to think that I’m a pretty active person (and will usually opt for the stairs instead of the escalator if given the choice — go me!) — and besides, why would you really walk that much when there’s an extremely sufficient and fast public transportation system running beneath the city anyway? After my first week here though, I got it. I probably averaged at least a few miles each day, between work, meetings, evening events and everything in between. And then there’s the fact that sometimes you would just prefer to walk regardless, especially when the weather is as perfect as it has been lately. The air is crisp, the city is bustling around you and around every corner, there’s a pocket of the city that is in some way new and fresh, and constantly changing. Suddenly, just by stepping outside your door, you’re part of a collective pulse — you’re feeding the city and the city is feeding you. Whenever I have the chance, I’ll try to give myself an extra 20 minutes to get somewhere, skip the subway and just walk. It’s the best way to explore any city, but especially New York, and yes, that means I’m often the girl who’s walking around, earbuds in, with a huge grin on her face for seemingly no reason. And you know what? I’m more than OK with that. Of course, this means, the right kicks to hit the pavement are in order. Naturally, I’ve been accumulating my fair share of flats and low-heeled ankle boots the past few months, and this patent “Alicia” pair by ALDO has been my trusty companion as of late. Plus, as my good friend and seasoned New Yorker, Christine, pointed out, they’ll make for a great rain boot option when the time comes. This post was in collaboration with ALDO. As always, all opinions and styling are my own. Thank you for supporting all This Time Tomorrow collaborations! I love this outfit! I recently moved to Portland, and you also do a lot of walking here, and I've been realizing that I need to look into getting more flats and boots I can walk in. I'll definitely be checking out those Aldo boots! Omg those boots are amazing! Perfect! Loving all the different colors, textures, and prints! Absolutely fabulous outfit, the way you've styled it is simply impeccable!! 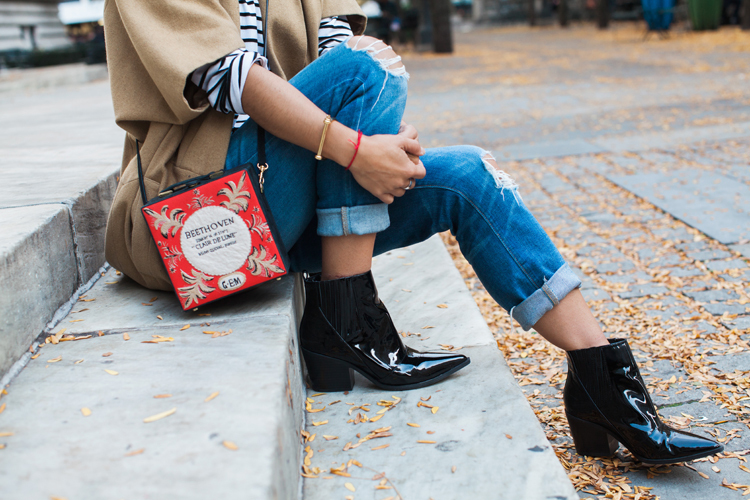 LOVE your box bag and ripped jeans! Aridity associated with information regarding the idea And once people observe the side effects on their entire body they cannot pretty determine what is occurring for them triggering be ZetaClear concerned Even when there’re at some point handed a diagnosis that it must be nail fungus disfiguring their particular claws they would like to determine what more it. Stunning and cool outfit. These boots are amazing! Stunning boots!! You looks very stylish!! You are so cool in this outfit. I love your jeans very fashionable and charming. I got such a pair from London!I must say,its very comfortable and different.You can comfortably put it on everywhere.No doubt,its the best boots for women .